Summer is actually getting at a very essential problem regarding any right here, the fact that rights may be, in our eyes, misused. The right to freedom of speech is no exception. This is exactly the reason for this article; to clear up some common misconceptions around the right to freedom of speech by explaining it in the detail that is allowed to us, considering the fact that it varies from country to country. I will do this by first globally outlining what the right to freedom of speech is meant to do, after which I will explain some of the nuances that are in effect in most countries. I will conclude with some of the common misconceptions we experience in our day to day lives. The right to freedom of speech, must firstly be understood in the right context. It is, first and foremost a political right. That is to say, not that it only applies to politicians, but that it is aimed at furthering the realm of politics. The right to freedom of speech is a right we will only encounter in societies that are more or less democratically organized. The reason for this is quite simple, but nonetheless elegant. It aims to increase the number of opinions and ideas that are present in the public debate, to further the democratic decisionmaking. This right is rooted firmly in both the classical (Athenian and some era’s of Roman rule) and the enlightenment principles that every idea might have value and that every idea must be based on rationality. The ultimate test of this value and rationality was, of course, the rational/philosophic discourse as we experience in debates and discussions everywhere to this very day. In this way, we can see that the aim of the right to freedom of speech is not just to give people who are politically relevant a voice, but to give them the right to be a dissenting voice; the right to disagree. This, then, shows us again that it is a democratic right. Dictators have no need for, in fact they mostly despise, dissenting voices. However, since the Romans and Athenians, somethings have changed. Where they used to have a system of direct democracy, in which all free males of a certain age and later as noblemen of a certain age, were allowed to vote on important matters in gatherings, and were thus politically relevant, we now have systems of representative democracy. We now vote for representatives who are expected to vote on that which is in the best interest of their voters. Not only that, but with the abolishment of slavery in most democratic societies, and the inclusion of women in the voting process, we find that the general population is now both more and less politically relevant. We are more politically relevant because more of us are eligible to partake in the democratic process. Less politically relevant, because once we have voted, our governance(save referrendi) is pretty much out of our control. This has however lead to more flexibility within our democratic systems. Where in the days of Athens one could with a fair amount of certainty predict which member of the gathering would vote which way, we now have the ability to change the makeup of our respective parliaments with a single vote, leading to different outcomes every time. To accommodate this new swing, and to give every relevant person or party a fair shot, the right to freedom of speech was to be expanded in such a way that even those who are no longer politically relevant (the people, after voting), would be more politically relevant by being able to exercise influence on both their representatives and the rest of the people. 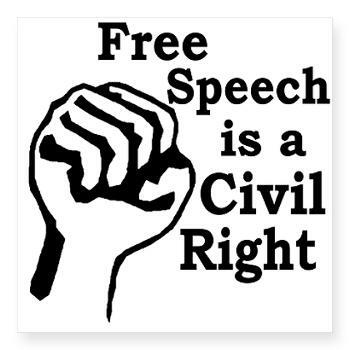 As such, the right to freedom of speech was now a civil right as well. This process had, in most countries, gone a lot more organic than the above text would make you believe. But the significance here is this: the idea behind the right to freedom of speech was not so much to “free the people”, as it was to further political discourse. It was to give those who would vote on what action the government would take the ability to review and debate as much possibilities as they could, in order to find the best course of action. It was only later that the noble idea of “freeing the people” was attached to this right. But free the people it did. You see, by legalising everyone’s ideas and opinions, a sort of equality was created. Every living human being has ideas and opinions, after all, and none are now inherently more valuable than others. 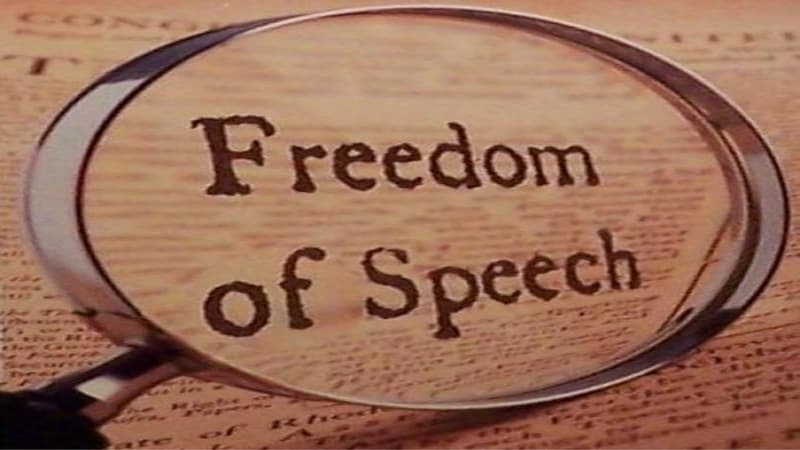 Another important context in which we must think about the right to freedom of speech, is that it aims (with some exceptions to which I will return later) mostly to remove any hindrances one might experience in voicing their ideas or opinions beforehand. Most notably, it removes the ability to be prosecuted for the voiced ideas or opinions in a legal sense. The right to freedom of speech goes no further than to allow, without fear of prosecution, a person or group of persons to say what they want to say on public property. This all sounds fairly uplifting. We have the right to say what we want to say, when or where we want to say it. Or do we? As we look at the last sentence of the previous paragraph, we can already conclude that there is one important limit to the exercise of free speech: private property. While everyone is free to speak their mind at all times, they may not be at every given place. A good example for this is for instance a newspaper. A newspaper, aside from presenting its readers with the latest news and celebrity gossip, usually provides these services within some sort of political framework. They have a message they want to spread, about how they think the problems of the world are best approached. Because the newspaper itself is private property, the owners and shareholders are free to decide what is and what isn’t printed on their pages. They may even decide, without any penalty, to censor an interview as long as it doesn’t amount to libel. This may seem like a violation of the free speech rights of the person being interviewed. And it jolly well is, to be honest. But the nuance here is property rights vs. civil rights. As the person interviewed has the choice to present the exact same case to a different, more accommodating medium, and is free of libel, the choice to allow this breach of freedom of speech in favor of ownership rights is an understandable one, if not an acceptable one. We have touched on another limit in applying freedom of speech here, ‘libel’ and ‘slander’. These are actually both the same thing, but one is in writing (libel) and the other is in word of mouth (slander). They both amount to the intentional and malicious misrepresentation of another person’s possessions, character or history. For instance, during the 2016 Presidential campaign, someone somewhere started the rumor that Hillary Clinton was running a child prostitution ring from a pizza place somewhere in New york. This, as many already thought was nonsense. This is a case of libel. The character of Mrs. Clinton was misrepresented, because it wasn’t true. This was done in a malicious way, because the intent was to make voters second guess their voting for the democratic candidate. It was intentional, because there was no evidence that she indeed had run a child prostitution ring. Yet another limit in applying freedom of speech is ‘hate speech’. This is a tricky one, because every country defines it in its own way, whereas the previous two limits are very similar globally. Generally though, the term hate speech amounts to the calling for violence against a person or a group of persons, based on ethnicity, country of origin, religious or political affiliation, sexual preference, gender or (dis)ability. This seems to speak for itself, but there is a nuance here, that is noteworthy enough to merit some attention. Generally speaking, it is allowed under the banner of free speech to say: “I want muslims to be deported.”, which some would categorize under the nomer of calling for violence. On the other hand, it is often not allowed to, under that same banner, say: “Let’s get rid of all the muslims!”. The difference here, is that -depending on the context, of course- the latter may imply a more physically violent event then mass deportation, which might lead to physical violence being committed on the group in question. However, I can not stress enough the differences that different countries maintain in their outlooks on hate speech. Saying: ‘Well, that’s my opinion, so I don’t have to defend it.’ Is a correct use of the right to freedom of speech. 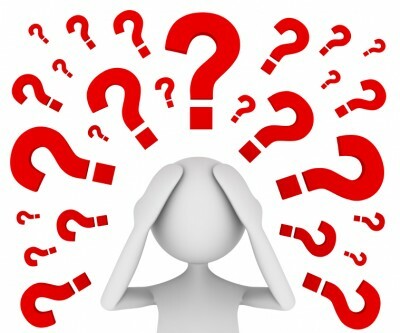 As we have concluded in the section “Reason for freedom of speech” above, the intention of the right to freedom of speech is to find out what ideas are rationally supported or can be rationally supported. Failing or refusing to rationally support your ideas, is thusly not a correct use of the right to freedom of speech. Rather, the person who is doing this, is impeding the discussion that the right to freedom of speech is supposed to support. they are doing so by introducing needless and unfounded chatter into the conversation, which can only distract from the issue at hand. Social media companies deleting comments are violating my right to free speech. As we have concluded above, in the section “limits and nuances to free speech”, that which is privately owned is not obligated to provide every statement with a platform for being voiced. Rather, they have the right to censor or delete entirely any comment that does not support their mission statement. the free speech of the commenter may be hindered by this, but the diversity of media and often pages within that media (such as on Facebook) will allow for sufficient opportunity to voice the opinion or idea. Considering this, the ownership rights the befall Facebook and respective page holders is more important. The threat of being physically abused because I’ve said something is a violation of my freedom of speech. First of all, I understand how it feels that way and I never condone any disproportional verbal violence, let alone physical violence, save self defense. However, being hit by anyone other than a government agent because of what has been said, is not a violation of freedom of speech. The freedom to say these things has not declined. It is the result that has gotten more expensive. Rather, it is your right to not be threatened and eventually your right to bodily integrity that is being violated. I don’t want those who disagree with me to have freedom of speech. We all disagree with one another from time to time. We can do so passionately. But if a person, for any other reason than are mentioned above, disagrees that their opponent is using their right to freedom of speech, I would say they do not believe in the freedom of speech. As we have concluded in the section “the reason for the right to freedom of speech” above, the whole point of free speech is the right to disagree. The right to freedom of speech truly is one of, if not the most important right that we have in democratic societies. Nonetheless, some limits ought to be imposed on it, to keep our societies from crumbling under its massive weight and possible implications. However, we should be duly vigilant when it comes to these limits, in order to safeguard this great piece of cultural heritage. We must remember that, though it is a political right by origin, it is now one of our most vital civil rights as well. It frees us all to say what we want and when we want within or upon public property and gives us a great amount of equality as well as the right to disagree with others and the status quo. It is now our own prerogative to determine what to say, when and with who we say it, and if we are ready to pay the eventual price for it. We are also, in our use of and by our debt to the right to freedom of speech obligated to do the best we can in defending our ideas and opinions against the inevitable attack from others. And whilst some regulations can, in my opinion, be a bit too strict, we must recognize that they are in place for legitimate reasons and vary from country to country. Tagged civil, freedom, hate, hatespeech, law, limits, misconceptions, Philosophy, political, right, rights, speech. Bookmark the permalink.